We have a saying at Jarrods, ‘the only limit is your imagination’. Tell us what you’ve always dreamed of and we’ll do our best to make it a reality, whether it’s bespoke staircases or unique fitted furniture. To achieve this, we take the Jarrods approach; our tried and tested method for creating custom-made carpentry for all of our customers. It isn’t just something that we’ve randomly put together, it’s based on many years of experience, especially the skills and knowledge of the man who gave his name to it. 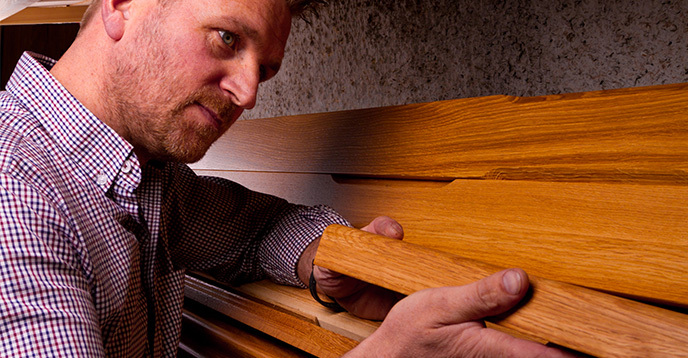 The driving force behind Jarrods is our very own Master Carpenter, Jarrod Matthews. That’s not just our nickname for him by the way. Every year, one person from across the whole of the UK is chosen by the Institute of Carpenters to be awarded the title of Master Carpenter. In his graduating year, they felt that Jarrod had the suitable skills, natural flair for carpentry and impressive eye for detail to earn the title for himself. Frustrated with the modular approach of the bespoke staircase and furniture industry, he wanted to create a truly bespoke business. And Jarrods Staircases was born. We’d like to think that the Jarrods Approach recalls the kind of skills, abilities and customer service that are more associated with days-gone-by. For this reason, Jarrod still assists in the day-to-day running of projects, providing input on quality control, and giving final sign off on the day of completion. Along with the rest of the Jarrods team, he also works on the research and development of new, creative staircase designs. 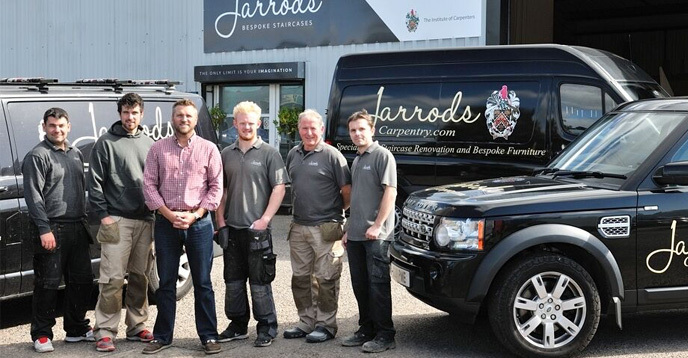 Since the Jarrods Approach is so engrained in everything we do, we thought we’d break it down into its various stages to show you the way that we work with all of our customers. At the point when you’ve decided that you want us to create a piece of bespoke carpentry, whether it’s furniture for a study, home cinema or bedroom, a fitted cabinet, or bespoke staircase, we’ll arrange to meet with you. In this first meeting we’ll discuss the materials and finishes that are available. If you need a bespoke staircase we can explore the best options to match the look and feel of your homes, whether that’s a modern metal staircase, a contemporary glass staircase or perhaps more traditional wooden staircase. Everything from the newel posts and handrail to the treads, risers and spindles can be combined to create your perfect staircase. If you want a unique piece of fitted furniture, whether it’s for a study, bedroom, home cinema or that awkward corner of the house, we can chat about your storage needs and create a solution that suits them perfectly. Once we’ve established what you need your staircase or furniture to accomplish, a jaw-dropping first impression or functional practicality, we can pass the brief on to our team of designers. Then the Jarrods Approach can continue to Stage 2 – the Design Process. If you have a picture in your head of the perfect staircase or fitted furniture for your home, our skilled team are here to help you turn it into a reality. Like we said, the only limit is your imagination, so get in touch today.